We narrowed down our choice to the colonial city of Arequipa in the south. With over 300 days of sunshine a year, average daily temperatures in the low 70s F and an inexpensive cost of living, it seemed like a good place to start our Latin American journey. We rented a large, three-bedroom beautifully furnished condo minutes from the historic center for only $600 per month. Large contemporary paintings by local artists graced every wall and there were colorful floor to ceiling ceramic sculptures scattered throughout the home. It was probably one of the nicest condos I have ever rented. 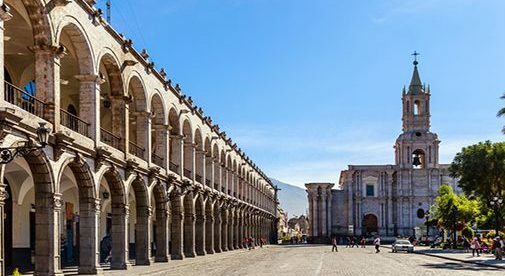 In Arequipa, it’s easy to find inexpensive rentals but there are also many properties available to purchase for reasonable prices. Single detached homes in popular neighborhoods such as Cayma and Yanahuara can be found in the $200,000 range. These typically have three or four bedrooms and may have a rooftop terrace or a small courtyard, both common alternatives to rarely seen lawns and gardens. We enjoyed our year in Arequipa but decided that it might be nice to live farther north where nights are warmer and the beach is at your doorstep. After an exploratory trip up the Peruvian cost, we fell in love with the small beach town of Huanchaco. It’s been a popular destination for surfers for years..
You’ll see traditional reed boats used by fishermen on the beach at Huanchaco. Huanchaco is the best of both worlds. It’s small town Peru but it’s only minutes from the large city of Trujillo and all its modern amenities. Temperatures are in the low 70s F year-round and it never rains. You’ll never need air-conditioning or central heating. Other than the odd housefly, bugs are pretty much non-existent. We haven’t seen a mosquito since we moved here. The fresh sea breeze blows through our wide open doors and windows all day. In Huanchaco, life goes on much the same as it has for decades. Street vendors crisscross town in the early morning hours selling everything from freshly made tamales to scrumptious baked goods to fruits and veggies. Show up at the beach early enough and you can buy fish direct from the fishermen as they return laden down with their catch. There is even a young guy that makes his rounds every week on a combination bicycle/grindstone who will sharpen all your knives for a couple of dollars. He parks his bike in front of your house, jacks up the back wheel, slips a pulley into place and pedals to turn the grindstone. “Pedal to the metal” takes on a new meaning! I recently saw a modern, two-floor three-bedroom penthouse apartment for $175,000. The spacious private rooftop terrace, complete with a small pool, provides a panoramic view of the town itself as well as the nearby coast. It is currently used for tourist accommodation but would also make a great private home. Across the street from our apartment building there is a large detached home available in the $200,000 range. Along with a modern kitchen, large garage and numerous bedrooms, it also has a small interior courtyard and rooftop terrace. Only minutes from the beach, it would be a gorgeous private residence but could also function as a wonderful bed and breakfast. I just returned from a two-day trip to Lima, Peru’s vibrant capital with a population of over 10 million people. It was hard not to notice the large number of beautiful condos for sale in the upscale seaside neighborhoods of Miraflores and Barranco. Lima is home to the largest number of expats in the country and most rent large apartments in popular neighborhoods. They enjoy the thriving culinary scene, business opportunities and vibrant cultural landscape. Monthly rentals for modern two- or three-bedroom units start at about $800. Once you hit $1,000 chances are good that you will have a sea view. In Peru, non-residents can purchase real estate with no strings attached. It’s a simple process with the help of an attorney and recent legislation has reduced the capital gains tax for foreigners from 30% to 5%. With a tourist visa that is good for up to 183 days per year, it is convenient to spend North American winters here. But it is also one of the easiest countries in which to obtain a retirement visa. The Rentista Visa takes six to eight weeks to process and only requires a guaranteed monthly pension income of $1,000. And there is no minimum age requirement. We’ve discovered there is more to Peru than llamas, Machu Picchu and the Nazca Lines! We’ve lived here a couple of years now and have just begun to delve into some the country’s best-kept secrets. Peru is still under the radar as far as retirement destinations are concerned. But its popularity is growing as more people discover the inexpensive cost of living, the comfortable climate and vast range of landscapes. 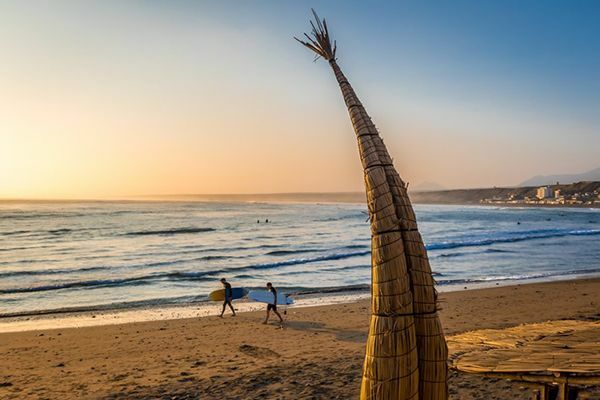 Whether you are a beach lover, a city dweller or yearn for acreage in the country, Peru probably has something to suit your budget and your tastes. Is Ripatransone Italy’s Best Hill Town?